This Research Brief presents key findings from an analysis of the National Early Intervention Longitudinal Study (NEILS) and the National Survey of Child and Adolescent Well-Being (NSCAW) to provide information about the developmental status and early intervention service needs of children under age three who are substantiated for maltreatment. The analysis described here was conducted by a team of researchers coordinated by the Institute for Social and Economic Development (ISED) under contract to ASPE. Children younger than three years of age are the most likely of all children to become involved with Child Welfare Services. (1) Among young children most at risk of developmental problems are those who experience child neglect and abuse. A major opportunity to minimize or avoid developmental problems is missed when maltreated children do not receive services that could ameliorate these negative experiences. In 2003, the Federal government amended the Child Abuse and Prevention Treatment Act (CAPTA) to require that infants and toddlers who are substantiated for child maltreatment be referred to early intervention services provided under Part C of the Individuals with Disabilities Education Act (IDEA). Little is known about the true extent of developmental problems of children substantiated for abuse or neglect, and those children subsequently removed from parental custody and placed in an alternative living environment. This dearth of information is in part due to the inconsistencies in child welfare practice across jurisdictions; variability in state and jurisdictional eligibility criteria for infants and toddlers for Part C services (Shackelford, 2006); differential policies, procedures, and practice competencies of public child welfare workers; and the differential availability of resources to serve children once identified. Further complicating the issue is the requirement under Part C that states must provide services to children who meet the state criterion for eligibility, but states may also choose to serve children who are "at risk of having substantial developmental delays if early intervention services are not provided." Only five states (CA, HI, MA, NM, & WV) currently serve such at risk children. National estimates of the extent and type of need for early intervention services for maltreated infants and toddlers are lacking. The purpose of this study is to provide such information. The overarching question guiding our analysis is: What are the developmental problems among children receiving Child Welfare Services that suggest a need for Part C early intervention services? 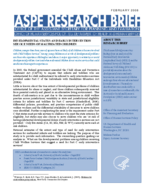 This Research Brief presents key findings from an analysis of the National Early Intervention Longitudinal Study (NEILS) and the National Survey of Child and Adolescent Well-Being (NSCAW) to provide information about the developmental status and early intervention service needs of children under age three who are substantiated for maltreatment. In addition to these two data sources, a literature review was conducted and discussions were held with Part C and Child Welfare Service experts.